The talent identification programme works to identify top Grade 6 students from across Kenya with exceptional intellectual ability and leadership potential. By identifying exceptional students from a range of socioeconomic, ethnic and religious backgrounds, and giving them a world-class education, the Academies aim to prepare leaders who will shape the development of their societies. Like many teenagers, 15-year-old Asma Shariff loves to play sports. But she is especially grateful for the opportunity to participate in football, basketball, and track and field because she comes from Garissa, a town in northeastern Kenya where girls aren’t allowed to play sports and are typically married by the age of 15. A supportive mother and a full scholarship to the Aga Khan Academy provided Asma with a ticket out of a town where, she says, girls aren’t encouraged to pursue education. 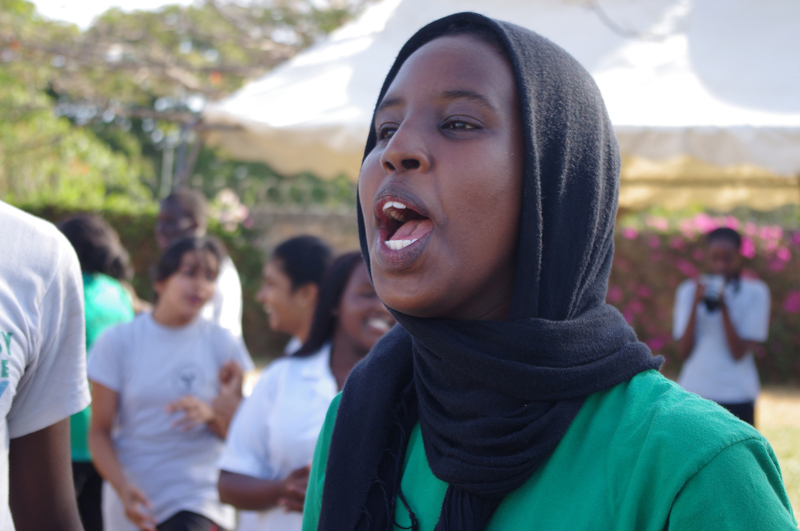 Asma was one of the scholarship students from across Kenya admitted to the Academy in 2012. She was selected through the school’s talent identification process, which involves assessments of academic knowledge, problem-solving skills, leadership capacity and social awareness. By identifying exceptional students from a range of socioeconomic, ethnic and religious backgrounds, and giving them a world-class education, the Academies aim to prepare leaders who will shape the development of their societies. “The key to future progress in the developing world will be its ability to identify, to develop, and to retain expert and effective home-grown leadership,” said His Highness the Aga Khan at the foundation stone-laying ceremony for the Academy in Hyderabad, India, in 2006. In an effort to develop such home-grown leadership, the Aga Khan Academies in Hyderabad and Mombasa run an intensive talent identification programme. It was established six years ago in Mombasa under the guidance of Paul Davis, Dean of Admissions, in collaboration with Dr. John Munro, a researcher from the University of Melbourne who is an expert in identifying gifted students from diverse backgrounds. The talent identification programme works to identify top Grade 6 students from across Kenya with exceptional intellectual ability and leadership potential. Identifying future leaders is a challenge. The Academies aren’t simply looking for the students who are at the top of their class, but for those with leadership capacity – a quality that can be difficult to discern in a child. The admissions process is made more challenging by the Academies’ commitment to provide students from rural and marginalised backgrounds – students who wouldn't necessarily seek a spot in the Academies independently – with an opportunity to obtain admission. In order to identify talented students from these communities, the Aga Khan Academy, Mombasa reaches out to its network of government and not-for-profit schools, including those benefiting from other Aga Khan Development Network programmes. Principals and Grade 6 teachers from these schools nominate outstanding students in their classes. These students are pre-screened by the Admissions staff, and the most promising are interviewed. Those who demonstrate to the greatest degree the qualities the Academy seeks – intellectual drive and curiosity, potential leadership ability, and good character – are invited to go through a secondary assessment process. This involves a range of activities, including a creative writing assessment, a personal writing assessment, problem solving tasks, another interview and a dynamic assessment. The latter gives students an opportunity to respond to instructions from the interviewer and show how quickly they learn. These assessments are done in English or in Kiswahili. “We are not just looking at prescribed learning, but taking into account how the students think and their creative thinking capacity,” said Paul Davis. Taken together, the range of assessments enables the admissions team to piece together a holistic picture of each student and to identify his or her academic and leadership potential, regardless of previous educational preparation. The multifaceted assessment process highlights the strengths of students who wouldn’t necessarily do well on traditional school entrance exams. Leadership potential, for example, may mean different things for different students. Some may enter the school having already taken on leadership roles in their communities, while others may be admitted because the assessment process highlighted their inclination to take on such roles in the future. Each year, students from rural and marginalised communities receive four to six scholarships for durations of up to seven years. Scholarship recipients display high levels of intellectual aptitude and leadership skills from a young age, even though many of them come from families that struggle to put food on the table or keep a roof over their heads. They include students such as Maxwin Oj’wang, who lives with six other family members in a two-room house in a slum in Mombasa. Before he was identified by the Academy for his sharp analytical skills, mathematical acumen and compassion, he attended a primary school that did not have enough seats or desks for all of the students. Similarly, aspiring accountant Elizabeth Wanjiku comes from a house with no running water or electricity that is headed by a single mother who struggles to make ends meet by selling chapati and beans. Elizabeth has always been highly motivated and talented academically and recalls working diligently to improve her grammar, even in Kindergarten. Many of the students are also preoccupied by social and political issues early on in their lives. When Japheth Otieno Arya, a student from Kisumu, came to the Academy at the age of 13 in 2012, he was deeply concerned about politics. In addition to thinking about international relations and foreign aid flows, he impressed his interviewers with detailed knowledge about Kenya’s new constitution. Inspired by his experience helping the sick and less fortunate in Kisumu, Japheth plans to become a neurosurgeon so that he can help people in need. The talent identification programme enables the Aga Khan Academy, Mombasa to draw together students from all corners of Kenyan society. The Academies network is on the way to achieving a student body where 50% are on some level of financial aid. This year, nearly 300 Academies students are benefiting from financial assistance that allows them to attend. The Aga Khan Academies also ensure an equitable gender balance across the entire student body – currently, slightly more than half the students are female. At each Aga Khan Academy, students meet and learn from others of diverse backgrounds. Students from well-to-do families are friends with those who receive substantial scholarship support. Students of different faiths and cultures, from various provinces and countries, live and learn together. On any given day, you can hear these students calling home in many languages and dialects. They also participate in and take on leadership roles in a variety of extracurricular activities, ranging from sailing to Model United Nations, that may not have been available to them in their former schools. “I’m quite amazed at how quickly the students empathise with His Highness’s vision. They express that in their thinking and behaviour,” Paul Davis says. Students, such as Asma, seize upon the leadership roles the Academy offers within a short time of coming to the school. Inspired by the opportunity she has been granted at the Academy, Asma promotes education among girls in her own community. She gives presentations to classes of girls at her former school about how it’s possible for girls to be leaders and why it’s important for them to get an education.